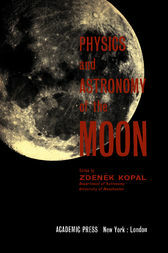 Physics and Astronomy of the Moon focuses on the application of principles of physics in the study of the moon, including perturbations, equations, light scattering, and photometry. The selection first offers information on the motion of the moon in space and libration of the moon. Topics include Hill's equations of motion, non-solar perturbations, improved lunar ephemeris, optical and physical libration of the moon, and adjustment of heliometric observations of the moon's libration. The text then elaborates on the dynamics of the earth-moon system, photometry of the moon, and polarization of moonlight. The publication explains lunar eclipses and the topography of the moon. Discussions focus on the photometric model of eclipses, brightness of the solar elementary ring, effects of light scattering, photometry of lunar eclipses, and determination of altitudes on the moon. The text then evaluates the interpretation of lunar craters, luminescence of the lunar surface, and the origin and history of the moon. The selection is a dependable reference for physicists and astronomers interested in the application of principles of physics in the study of the moon.